In today's increasingly technology-dependent world, part of me wonders if Abbey's inspiring words have been lost, forgotten, or ignored. Even in Moab, Utah, where Abbey wrote Desert Solitaire, you would expect such salt-of-the-earth ideas to stick – not only in the minds of those who self-identify as outdoor enthusiasts, but in their environmental behaviors as well. The world-class opportunities for outdoor recreation in Moab are hard to deny. Almost everywhere you look, outfitters, gear companies, and extreme attractions are clustering around the small highway which connects Interstate 70 to Arches NP and Canyonlands NP. Visitors from all over the world have ventured to experience these geologic formations, which undoubtedly took millions of years to deposit and erode, up close. But it is more than just an inspiring vista. It is a vacation. A free-for-all, if you will. One could hardly deny the increased traffic in the Moab area this Memorial Day weekend. At one point, the exhausting line of gridlocked cars, trucks, and RVs extended clear into Crescent Junction. At the supermarket, one could not even turn around a grocery cart if they wanted to. Even Arches was shut down due to the flooding of tourists wishing to enter the park on Saturday morning. With visitation in this popular area going through the roof, how can this exponential growth be sustainable? What does increased visitation really mean for the future of outdoor recreation in this small community? And how will the natural places just beyond the city streets, old buildings, and newly developed hotels in Moab be affected over the long term? Now more than ever, we need to reconnect with the earth. By exploring natural spaces sans technology, we can rediscover the what it means to be human. Hiking along Devils Garden in Arches, I begin to step away from any reminder of civilization. 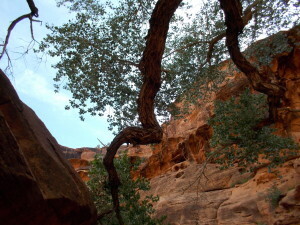 Birds buzz so loudly that you can hear the sounds of their wings echoing off of the canyon's walls. As I crest a large fin, a section of horizontal sedimentary strata, near Double-O Arch, I find myself in a land devoid of human presence. An aliveness within me, something I have not felt since childhood, stirs. Am I still in a National Park? Or am I in an area which can no longer be defined in simple, human, "civilized" terms? This area is so vast, so real, yet so unimaginably unfathomable. Gaining a true sense of the earth's dynamic treasures is no simple task; geologic landforms and living landscapes can confound even the brightest of environmental visionaries. Canyons and archways, cottonwood groves and vistas, even small patches of soil, so rich with aliveness – ensuring the protection of such naural landscapes from harm is equal to protecting ourselves. To truly understand wilderness, one must experience the great outdoors for oneself. This means free of bicycles, ATVs, smart phones, social media, and any other devices which may cloud our perspective or seek to seperate us from the natural world. When going into nature, we should be truly free of our own entitled and arrogant perspectives. Free of ourselves and our demanding egos. Free to listen to the sounds of silence. Society must recognize the ever-expanding, non-monetary values associated with these natural areas in order to improve the quality of our own lives. Supporting the designation of vast tracts of untrammeled land is a cause worth of your full-fledged support. If you are interested in learning more, or how you or your organization can become an environmental leader in an ever-changing world to protect natural spaces, consider taking part in a minimal impact wilderness experience with Plateau Restoration. Enjoy the out of doors with an experienced and responsible guide. The compassionate and ethical experts at Plateau Restoration delight in inspiring others to foster more holistic environmental values. If you are unable to visit the Moab area, consider a generous donation in support of restoring habitats for wildlife and preserving the integrity of wilderness settings. John Aldridge is the Conservation Media/Marketing and Field Intern with Plateau Restoration, Inc. for the summer 2015 season.